Many baseball players search for ways to improve their swings. Rubber bands can help with that. 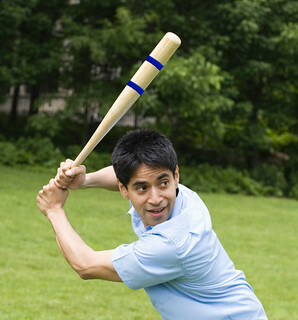 Simply place the rubber bands onto the barrel of the bat about 3 inches apart centered on the sweet spot. The rubber bands will serve as a visual cue to help the hitter keep the sweet spot in the hitting zone. Be sure your hands are ahead of the barrel of the bat and that the sweet spot (as marked by the rubber bands) is on the ball. Swing Away! Tell us how rubber bands make a difference by emailing us at bandology@alliance-rubber.com. Remember to comment below!